It’s all change at L’Avenir. The dark brown labels with African pictographs which were introduced in 1995 have been replaced with a clean modern-looking label which is an updating of L’Avenir’s original label showing rows of vines leading to the winery. The new labels cover three tiers of wine. The entry level wines under the ‘Far & Near’ branding are priced at the cellar door from 50-55 Rand and use grapes sourced from outside the farm. The top two ranges once again are ‘Estate’ Wine of Origin. The mid-range wines are priced from 90-120 Rand. The premium range are registered Single Vineyards, and priced at R180 for the Single Block Chenin Blanc 2012 and R300 for the Single Block Pinotage 2012. These bottles are individually numbered and signed by wine maker Dirk Coetzee. In another acknowledgement of the past, the bottles are dedicated to Francois Naudé, Lavenir’s winemaker and viticulturist from its beginning until his retirement after the estate was purchased by the French wine company Laroche. 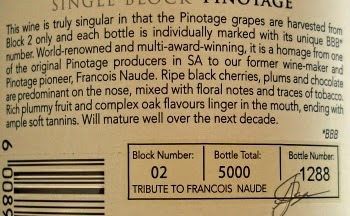 The estate vineyards have produced exceptional wines over the years — at the time of his retirement Francois Naudé had won the Pinotage Top 10 Competition more times than anyone else — and it is good to have the Estate certification to again confirm the source of the wine. Even better for those who like to drink a wine with a sense of place and terroir is the single vineyard registration of these blocks. 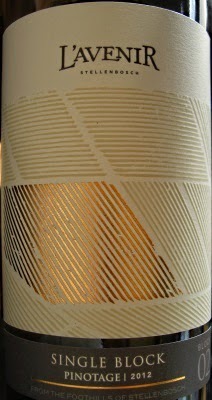 Their labels are based on a satellite image of the vineyard with the named block highlighted in gold. The Estate Pinotage 2012 is wonderfully exciting now, lively and giving real pleasure. It’s a wine that made me stop and say ‘wow’. Could keep but I’m enjoying it too much to wait. 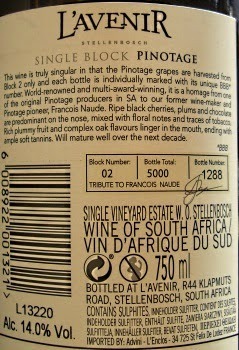 Block 02 Pinotage 2012 is a taut, powerful, intense yet restrained wine. I’m keeping mine for a several years because I think this is going to develop into a real humdinger.